This is a beautiful line directly up the middle of the Community Pillar formation. There are many opportunities for variations, and you could climb the route several times and have widely differing experiences. The choices aren't always obvious, so some explanation is in order. My suggested first pitch of community pillar. . I have heard of people climbing on the outside of the huge chockstone (passing it on the left), but have no first-hand experience. In all these cases, the route continues up the wide crack above the chockstone to a large ledge and easy ground beneath a deep chimney. This point can also be reached by a variation start which bypasses the chockstone and its associated squeezes: climb a 5.8 corner about 30 yards to the right (west) of the normal start. The next pitch goes up the easy ground and enters the deep chimney, bearing right at the overhang. The tunnel at its top is pleasant and roomy. Belay at the large ledge. There are two choices above. On the right is a long crack and squeeze chimney with limited protection (5.8). To the left, you can ascend some blocks to a clean, varnished hand crack. This is generally considered 5.9, but is better protected than the wide crack. Both options lead to a small ledge beneath a steep, featured crack. Another pitch up this crack takes you to a belay in a surprisingly extensive cave. Again there are many ways to continue. The obvious-looking (but not recommended) "window" to the right leads west to Cartwright Corner and substantially harder climbing. It is possible to step back out of the cave entrance and climb the unprotected face on hollow-sounding flakes. Another way is to climb straight up the crack in the cave and move left via some peculiar bomb bay moves and go through a narrow portal leading back to the outside and an easier crack. Probably the best option is to continue up the crack (bearing slightly right at the portal) and heading toward the apparent dead-end at the cave's roof. An unseen squeezeway at the top leads to an opening through the rubble into the floor of another cave above. This is the the upper belay spot for all the cave variations of this pitch. Climbing above this point leads through an obvious opening above and follows progressively easier climbing to broken ground and the unroping spot. From the top, scramble to the right (west) to a pine tree in an area of broken rock. Rappel cautiously, then scramble down to the small saddle separating this formation from the Magic Triangle to the west. The most common descent these days is to rappel the gully to the north (which can be done with a few 30-meter rappels). The original descent involves scrambling south and going down the Crabby Appleton approach gully with a few short rappels. An alternative descent, using double 60m ropes, goes via rap stations on Chocolate Flakes. Scramble to the south to a pine tree in an area of broken rock. Rappel west on one rope. Scramble north to a large obvious pine tree to make a second rappel on one rope - this second rap going north and landing on a ledge with bushy vegetation. You are now roughly at about the same elevation as the the top anchor of Chocolate Flakes. Go through / skirt above bushes on skier's ~right for 10 or 20 feet (? ), then scramble up and over to the east on ledges; i.e., do not fully go down the revealed gully on trodden tree-bush trunks and limbs. If this traverse is done correctly, you will end up on a broad sloping ledge with bolted rap anchors about six feet below on a steep face that faces east - the top anchor of Chocolate Flakes. Do three double-rope raps to the ground. The first two are around 55 or 60 meters each; on them, you will pass up bolted anchors at about 30 meters (they'd be hanging belays / rap stations). My suggested first pitch of community pillar. Reviewing beta for the upper pitches. Halfway up the 5th/cave pitch,per Handren book. Near the top of the cave pitch. Amazing pitch! The start of the wide crack midway up the route. The start of the upper cave pitch. What a great route this was- did it today finally with some great friends and had a blast. The first pitch wasn't as bad as many had made it out to be, but I suspect that is because it is highly size dependant- the bigger you are, the more you're going to suffer. Luckily, Larry checked out a variation first pitch that starts on the left side of the adjacent gully (i.e. the gully to the right) and meets up at the top of the corner on the second pitch. Also, if you're solid at the grade, I highly recommend the hand crack variation on Pitch 4- amazing! Steep, exposed, and sustained! Climbed this in early '06. Great route! This route involves unrelenting and varied types of OW almost the entire way...One of the most physical routes I have climbed so far. While climbing it, I thought I was hating life, but this route grows on you after you are done and you start rehashing how great it was. Also should be rated R on two of the pitches (4 and 5, if I remember correctly). P4 seemed the sketchiest lead due to the fact that the 5.8 sections are not really protected and the placements you DO get for the last 80-90 feet (i.e. the majority of the pitch) are small pro in useless flakes or brittle-ish cracks that would blow in a fall. If you want true gear on this pitch, nothing other than Big Bros would protect the majority of it--no joke!! The 5.9 alternative pitch is a better protected option (our friends behind us took it ... that's how I know). Climbed this route again, for the second time, on July 3. We started the first p at 7:45. Most of the route, and all the belays, were in the shade. I used a #4, #5 cam, and a #3 big bro, several times. I wished I had brought a # 4 big bro. p4, in the DeAngelo guidebook. This is the most HILARIOUS route I've done. Watching your partners squeeze through impossibly tight hole after impossibly tight hole is priceless. I highly recommend that everyone gather up all who are willing and do this route! Scramble up to the back of the chimney to reduce rope drag. Looking up, to climber's right is the tight squeeze chimney which is the original 1st pitch. To the left there are two holes around the chock stones. The hole farther to the left and farther outside the chimney is bigger and has light shining through it. The hole to the right and deeper in the chimney is smaller and is completely dark. This dark hole is what you want. Pitch 1: Climb up the right side of the chimney for 10 feet, then traverse left to reach the dark hole. Move up into the hole a few feet, then look to your left to see its exit. Squeeze/contort through this hole and you will pop out directly above the other larger hole and be able to see your partners below. Belay here off of slung chock stones. Pitch 2: Move belay up on top of boulders to base of obvious offwidth in a right facing corner. Head up this offwidth (easier than it looks, lots of good face holds) and belay at one of the nice belay ledges above it. Pitch 3: Follow crack on the left to a chimney above. Stay right of a large tongue of rock in the chimney. Jam, stem, and chimney until it is possible to walk deep into the chimney, and squeeze up and out of a hole onto a nice belay ledge. Belay takes 2"-4". Pitch 4: Head up the offwidth on the right side of the belay ledge. The start is hard, but it eases off within 10 feet. Continue up the offwidth until it turns into a huge chimney that you can stem to the back of. From here, stem/chimney/faceclimb up and squeeze out a hole on the left side of the chimney into a cave. Crawl out of the cave and belay on a nice belay ledge. Belay takes 2"-4". Pitch 5: Jam and face climb up crack on the left side of the belay ledge. Climb up to a chimney, then walk into the chimney into a huge cave. Belay here using .3"-3"
Pitch 6: In the back left of the cave, jam up a crack that eventually widens to an offwidth. Continue to jam and stem up until almost to the ceiling, then look behind you for a small hole and squeeze through this into a nice cave with exits to the north and east. Head for the east exit (climber's left) and belay there. Belay takes .75"-3"
Pitch 7: Exit out of the cave and onto the face. Slab climb up the route of least resistance to the top. Belay at a horizontal crack .4"-1". From the top head to the second pine tree to the south west. From here carefully do a single rope rap down a lose gully. Scramble down to hiker's right to a large pine tree and do a single rope rap to a large bushy ledge. Traverse to hiker's left above slabs to a large vegetated ledge. From here do a short single rope rap off of a small tree and slung boulders to a ledge with a large slung boulder and two nuts fixed in a crack. Do another single rope rap here to another large vegetated ledge. From here scramble down to a small tree and do a single rope rap to yet another large vegetated ledge. Scramble down the ledge to another small tree, and do a single rope rap here. This rap will bring you to one of two last rappel stations. The first of which has a small bush, a fixed nut, and some horrible looking slings that NEED backup. The second possible rap station is in much better condition and is a slung large chock stone of sorts. However, to get to the better rap station it is slightly more than 100 feet. The belay spots as marked in the Handren guide don't match up to the description. We went left istead of taking the first tunnel, belayed at @100' on top of the chockstone. This has fair pro, is semi-crunchy, and a good option for us barrel-chested folks. From the top of the chockstone a low 5.8 physical crux protected by 4+5 camalots led to easier face (protected with blue bigbro), ledgy scrambling interspersed with jams, up to a steepish looking chimney right of a prominent tongue/roof that features some of the best rock and pro on the route. The finishing squeeze was mellow, not tough for bigger folks. I topped out this long (210') second pitch to a nice ledge with 1-3" gear. The 3rd pitch was the start of the more rotten, runout, intense stuff. Used 2 bros (green+blue) and all the big cams on the pitch. Still runout, still spooky considering the hollowness that's mandatory to get up the pitch. Belay took 2 hand-size hexes and the #5 cam. Spooky rock continues on P4 but easier and more fun climbing; good jams and pro the whole way. The belay cave took any size cams and was impressive and spacious. P5 was the psychological crux-numerous bad-looking options presented themselves, from the chalk it looked like a lot of scratching around was done before the last party committed+went for it. Head up the interesting crack in the corner you're belaying out of, place a six high (possible #4 6' higher for the paranoid and/or cautious), then step back down and head out a bottomless flare that aims east and has pretty wild moves. The climbing doesn't relent entirely til the belay, the most consistent 5.8 on the route. Last pitch runs out the rope on low 5th class up to a big flat ledge in sight of a tree that marks the descent gully. Use of a few pieces will keep the rope running smoothly, otherwise snag potential might waste some time. Descent beta: one 70 works perfectly on the raps, the first tree you see with slings at head height is an easy no-hands walkdown, head towards the Magic Triangle, don't bother with the rappel. The next tree is at the top of the Triangle gully proper, and is pretty short-50' or so off of small trees linked with a lot of cord and extended pretty far towards the lip. There's an interesting looking hole in the ledge not far down this rap-don't use this unless you brought 2 ropes. With a single, touch down beside the hole and walk climber's right to a slung boulder/nut anchor. A full rope rap puts you 25' above another tree, a solid scrub oak. I replaced the bleached slings on this one with a new dyneema. Another full length single rap leads to scrambling down the easternmost side of the gully to the final rap tree. On this rap, even with a 70, you'll come up 8 feet short. Aim slightly right to an easy varnished corner that is fine to downclimb at 5.3 or so. This lands you 20' from the base of Small Purchase and a 2 minute walk to your packs. Climbed this last week and did the left corner variation to start and avoid the first chimney per a recommendation- went at about 5.8 on fun, steep huecos. Rock quality is a wee bit suspect but just be gentle and check holds. The hand-fist crack variation was super fun, steep jugs and crack moves, recommended! Crazy route. Totally worth doing for the unique climbing. Be sure you can strip everything off your body to make the squeeze moves on pitch 1 and on the cave pitch. To me the best pitch was the "5.9" hand crack. Just climb the overhanging corner straight above the belay (not to the right towards the off width) - it has great holds, good stemming and bomber gear. Continue straight up for a full 70 meters of great varied sized crack climbing to the belay in the cave (just as you run out of rope). Careful gear use will get you all the way there to a great belay. The cave pitch is crazy too - with an unseen exit out a window on the wall behind the climber just as they hit the top of the cave crack. You do not need any big gear on the entire route as it is either small gear or too big to protect- a single rack, double 2 inch and 3 inch with a single #4 camalot - worked fine. I have done this route twice this winter and have some comments. P1: We have done this by starting both to the left and to the right. The right side adds about 8 ft of squeeze chimneying and it is tight. I am a 5'8" female and with a fleece on I move through pretty snug. It is impossible to tunnel through w/ a day pack on so consider dangling it from your PAS or having the leader lower a section of rope through the holes at the belay and pull it up. All that being said- this is my favorite part of the route. The initial moves into the hole seem improbable but just go for it. Protects with a #1 & #2. The left start requires a tricky traverse left before diving into the mess of chockstones. You will still have to go through a smaller section of chimneying but your rope drag will be heinous. P3: The 2nd go around we did the variation. Let me just say, for all those Indian Creek addicts, I would NOT call this pitch a "beautiful hand crack", not even by Red Rock standards. The start is a bit cruxy and has a bouldery feel but ends on jugs. The mid-section is steeper than the rest of the route and the crack just has a weird feel. It is kind of an offset shallow corner. That being said this is still a really cool pitch and a great way to skip more OW and there ARE handjams to be had. Doing the variation led us up and past the P3 belay ledge and straight into the P4 cave belay. Only had 10ft of rope left on our 70m. Descent Info: The descent kinda screwed us up our first go around as there are several descent variations. We found that the best descent information came from the picture posted by Larry DeAngelo and the Descent beta from Benjamin Smith. I recommend scouting out the descent from the Pine Creek trail before you start ascending to the base of the route. Follow Smiths directions for the first 2 rappels then follow the slabby ledge to skiers left and the ONLY discrepancy is that where the next 4 rappels start there are now 2 bolts for anchors whereas Smith says to look for a "small tree and slung boulders." We rapped through the hole subsequently bypassing the chockstone/nut belay situation. Also- at least 2 of our rappels would not have worked with just a 60m so not sure what people were saying there. If you only have a 60m you WILL have to do some downclimbing. 1) On lead, take only a half dozen cams: 0.75" to 3". Save a couple 3" pieces for the belay just above the chockstone. Put ALL/ONLY that gear with slings on your left gear loop and leave EVERYTHING else behind including any helmet, wallet, etc.. Go left side in. 2) Once above the chock stone, find an independent outward opening and lower your rope to haul everything else up that you'll want on the rest of the route. The long right-side crack on P3 is very well featured and turns into a widening chimney after 40 feet, I don't see how one could fall out after that point. Pro is good for the first 40 feet with cams to #5 and smaller pro in adjacent cracks. 90 feet up the pitch you can go deep into the chimney to a varnished finger crack that takes excellent pro. The cave pitch was the best, we went the recommended way here and what seemed to be the most obvious line. It was quite easy after the first couple moves. Just go up the awesome varnished corner crack on the back wall then trend right to another varnished crack where you will then see a window up and left to crawl through. Holy crap this route was amazing! It felt like the McDonald's PlayPen of rock climbing to me. I cackled in glee and delight as we squirmed through holes and found improbable tunnels in the ceiling of caves. The 5.9 hand crack variation felt like it was transplanted off another climb, awesome pitch but airy and continuous instead of burly and puzzling. For the 5.9 variation, a single rack with to 4 doubles in 0.4 to 1 or 2 would serve you well. The 5.9 crack also takes nuts surprisingly well. Be *very* careful about loose rock on the last 4th class stuff. I almost pitched myself and a completely detached bench-sized shelf of chickenheads into space. This is one of my favorite climbs of all time but one of my least favorite descents--not in the least because I mucked it up. But because I want to share the joy of this route, here is what I can find about the descent, so when you're looking at the Mountain Project app in the dark you can thank me. Option 1 (not preferred): This is the descent that Benjamin Smith and Cunning Linguist describe, updated to the way I found it in March 2017. Not preferred because you rap a loose gully, a lot of this tat is looking a little aged, and because you can't quite make all the raps without a long 70m rope. When you top out, you'll walk "into the cliff" past the summit and locate a big pine tree with some cord on it. Rap North down the *loose* gully to a big ledge where you can unrope. Walk down and skier's right to an easy scramble down to another sizable pine tree with slings. Rap to the East to land on this huge, exposed, 4th class ledge. Pull your rope and walk to the skier's left to the bushy area. Where there is a big cairn right on the edge there are two bolts on the ground, with some tat. Rap straight down to a smaller ledge with two nuts and some slung boulders. Don't go down the chockstone hole if you have a single. Rap straight down again, a long rap, to another big two-tier ledge. On the bottom tier you'll find a small sturdy oak slung. Rap straight down again to another sizeable vegetated ledge. If you look down East (skier's right) of this ledge you'll see a tunnel of bushes. Straight down North is a blank face that you don't want to rap with a single. Either scramble or rap East down the bushy tunnel for a pretty long ways. It's pretty slippery but doable. We rapped (left a green sling on a sturdy pine tree on the East side of the ledge) and the rope didn't get stuck on anything. You'll come to another small but sturdy tree backed up with some stuff. From this tree, with a 70m rope, you will be only a few feet off the ground, and you may have to unrope and downclimb. (My Sterling 70m rope put us about 3' off the ground.) The ground slopes up to climber's left and there are some alcoves you could easily downclimb. I don't know where the intermediate rap would be with a 60m. Hike right following the base of the rock until you find the trail down. Option 2: I did not get to try this option, but this beta is firsthand from someone who has done it twice and claims that this way is the best way. From the top of the feature, scramble down and climber's right with a little bit of downclimbing. Work down to a ledge with a pine tree with slings. Rap WEST (deeper into the canyon); this rap supposedly looks "improbable." You go over a bulge/slab thing and come to a ledge. You unrope and hike down a trail a bit until you find the next rap. 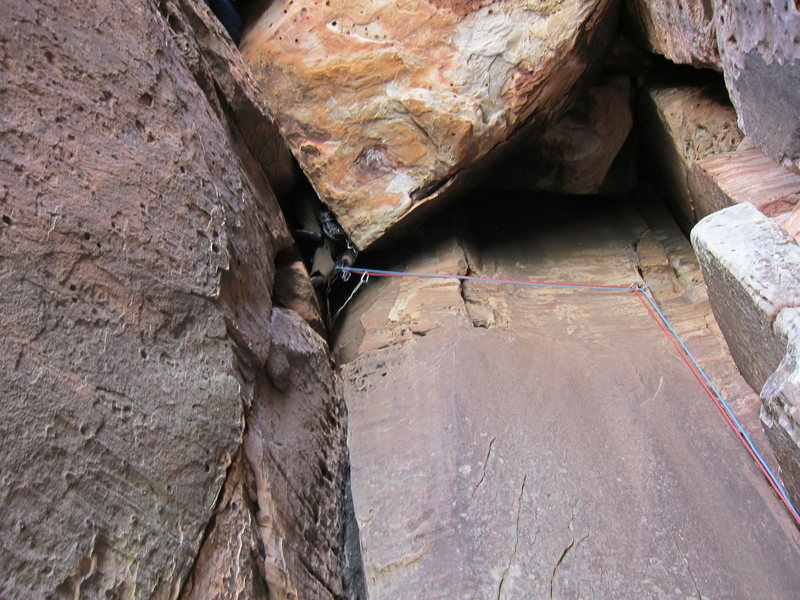 It is then 3 more single-rope raps interspersed with scrambling down a gully to the ground. As I recall, from the top of the last 5th class pitch, exit the cave climber's left and scramble up and slightly right for a couple of minutes up the obvious path of least resistance. This deposits you on a large ledge with a big pine with obvious rap slings above a troublingly loose gully. Don't use this rap. Instead, turn sharp right and scramble down 3rd / 4th in another small gully. At one point this requires tunneling under a chockstone. After about 75', this deposits you on a second large ledge. Turn skiers' right and spot another large pine with rap slings positioned high on the trunk. Rap from here down to a scruffy ledge and traverse skiers' left into a large sandstone bowl. Look for a cairn on the far side of the bowl. It marks the location of a bolted rap anchor driven straight down into the slab at the lip of the bowl. . Rap from here down a huge chimney, landing on another brushy ledge. The next rap is from an obvious medium sized tree (an oak as I recall). This deposits you on yet another brushy ledge. Scramble perhaps 30' down and skiers' left to a bolted anchor. From here, a 195' rap reaches the ground. Turn skiers' right and walk ~ 5 minutes to the base of the route. We found this descent to be straightforward and efficient with good pulls. There was a section or two of loose rock as well, but nothing an attentive party need worry about. Did this 12/10/17 with near perfect conditions - a touch cold but clear skies and no wind. This climb easily made my top 5 Red Rocks climbs because it is varied, interesting, and has some very cool features. I did leave my sunglasses in the cave, so if anyone climbs this and finds them, shoot me a message!! 8/30/18 Edit: Did it again today using the alternate start. The 5.8 corner is a bit funky and stout for the grade. Did it in four pitches with an 80 meter rope. P1: Ground to the top of the chimney (80m); P2: Top of chimney to cave (70m+); P3: Cave pitch; P4: Upper cave to top. On P1, rope drag can be avoided if you don't place gear through the 4th class middle section. My climbing partner, who is quite buxom (DD) simply could not fit through the squeeze on pitch 1 because her bust got in the way. I had to lower the rope through the gap in the chockstone and belay her up that way. That was fairly easy to follow, but the holds are fragile and she broke one on the way up. The 5.9 hand crack I would rate at 5.9+/10a because it is steep, sustained, and has a couple distinct cruxy sections. It also has very little in the way of good stances to place gear, adding to the enduro-factor. As a point of comparison, it is way harder than the 5.9 second pitch on Dream of Wild Turkeys. Followed the route description descent beta w/ Mary Lane's additional beta and we got down without getting lost. My only comment is on the first rap: The first one down *needs* to take shelter from falling rock. I told my my partner to hide behind a big boulder and seconds later our third dislodged a grapefruit sized rock that flew right where she had been standing. If you go right into the chimney squeeze i found it to be quite gnarly. Im 5-8 , 155 pounds...ill jump out to on a high exposure face climb over that crack anyday....but it was dope. I highly reccomend if u can fit. Quite the litany of fascinating features. Bit physical for chimney noobs like me but no fingrr pump.